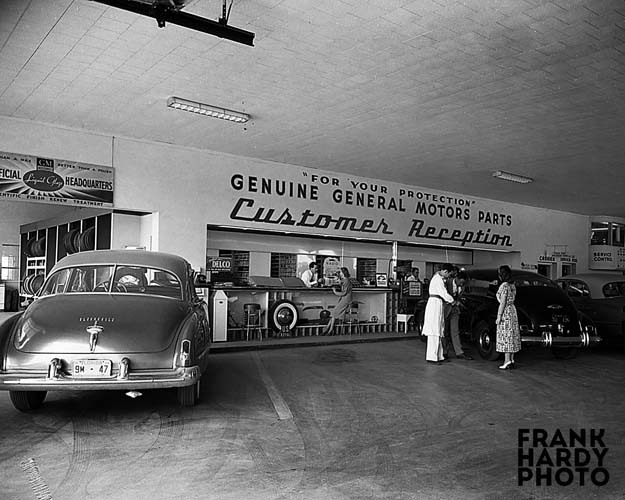 Here are several of the Oldsmobile dealership … Mitchell Motors. This dealership used to be on the corner of Pace Blvd and Garden / Navy Blvd. Above is the part’s / service department. Notice how the service representative is wearing a white lab coat. Below is a panorama view of the exterior of the dealership. Having grown up in Pensacola (1945 – 1973) I had driven past Mitchell Motors many times. However, that photo looking North up Pace (O) brought back memories. During the Summer of 1963, between high school and Pensacola Junior College, I worked for Soule Construction Company which was further up Pace, a bit north of Cervantes. Often, when I got off at the Company yard, I had no ride home and had to walk down Pace, across the old Bayou Chico bridge, and on to my house down near Bayshore Drive. After a hard day’s work on the construction crew, coming down the sidewalk and getting to that corner post in the picture meant in my mind that I was almost home. I can remember when Mitchell Motors was at the Pace (O St.) and Garden location. The cars sitting outside are 1956 Oldsmobiles. WE MOVED TO PENSACOLA IN THE 1950’S. I DO REMEMBER SOME OF THE PLACES. THE MEMORIES. I WAS SURPRISED BY THE NUMBER OF THINGS THAT WERE FIMILIAR. Someone else who worked at the Atlanta location, Frank C White, Bookkeeper. I believe he started with them in 1947. My father, Kenneth Fulghum, built the Mitchell Motors building.